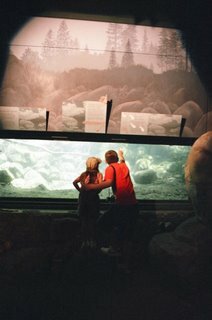 Home of the "Washoe Seeress"
There’s a place at Lake Tahoe where you can look eye-to-eye with fish without getting wet. The place is the Stream Profile Chamber at Lake Tahoe’s Taylor Creek Visitor Center on the lake’s southern shore. The center is located on Highway 89, about three miles north of the intersection of U.S. 50 and Highway 89. The Stream Profile Chamber offers the chance to get an underwater view of one of Taylor Creek, one of the many natural streams that flows into Lake Tahoe. Floor-to-ceiling glass windows in a special, underground exhibit present a one-of-a-kind view of the creek, which is home to trout, Kokanee Salmon, crayfish, frogs and a variety of water insects. In addition to offering a fish-eye perspective, the Stream Profile Chamber contains a large mural depicting the four seasons of Taylor Creek and displays describing the various fish, plants and animals found in or around the creek. The chamber, however, is only part of the reason to visit the Taylor Creek facility, which is operated by the U.S. Forest Service. The complex also includes an information desk manned by forest service rangers and a small gift shop. Additionally, the Lake of the Sky Amphitheater, an outdoor stage with seating is a popular site for special nature programs offered by the rangers. In the meantime, you can also enjoy one of the ranger-led informal “Patio Talks,” offered daily in the summer months. The brief presentations cover a variety of topics such as Lake Tahoe plants and animals or the region’s Native Americans. There are also several short trails that wind through the area around the visitor center. The Rainbow Trail is a half-mile paved loop route that leads to the Stream Profile Chamber. This trail starts at the visitor center and soon leads into a small grove of quaking aspen. Interpretive signs along the way describe the natural history of the area. At about the half-way point, you reach Taylor Creek, a natural trout and salmon spawning stream. The creek is peaceful and beautiful as it meanders through the trees, heading toward Lake Tahoe. A wooden walkway has been built over the stream and affords a nice place to just stand and enjoy the lush surroundings. The month of October is the time of year the fish are most active and when you can see several varieties of fish swimming in deeper pockets of water in the creek. The trail leads into the Stream Profile Chamber. Exiting out the other side, the trail continues into the trees before winding its way through green meadows and over several smaller streams. If you look behind you on the trail, you can see majestic Mount Tallac in the background (it’s the mountain with the snow that is shaped like a giant cross on its southern face). The other main developed trail is Lake of the Sky Trail, which leads from the visitor center down to Lake Tahoe. This half-mile trail includes a wooden wildlife viewing deck, which offers nice views of the Taylor Creek marsh and meadow. The deck also boasts a colorful, panoramic display that points out many of the plants and animals that live in the area (and where you might see one if you look closely). It is also a popular spot for birdwatchers. In the summer months, the Taylor Creek Visitor Center and Stream Profile Chamber are open daily from 8 a.m. to 5 p.m. There is no admission charge. For more information contact the Taylor Creek Visitor Center, 530-543-2674. A string of ducks—a mother and three, fuzzy offspring—swim upriver in a line, each weaving perfectly to the movement of the one ahead. Tall cottonwoods and willows provide a shaded and protected habitat for ducks, geese, herons, muskrats, kestral falcons, doves, beavers, squirrels and other creatures not usually seen in the rapidly-developing Truckee Meadows. 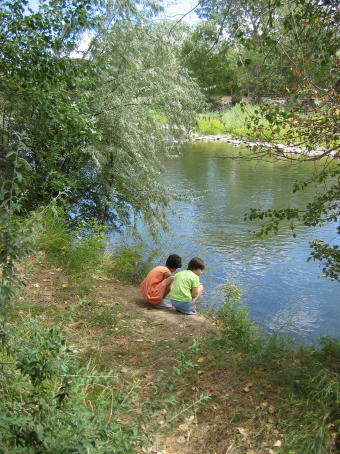 The setting is the Oxbow Nature Study Area, a unique wildlife and plant preserve located on the Truckee River at the end of Dickerson Road in west Reno. To reach the area, drive west on Second Street, past Keystone Avenue, then turn left on Dickerson Road. The study area is dedicated to preserving the plant and animal life once found in plentiful supply in the Truckee Meadows. To that end, visitors can wander on more than two miles of trails marked with interpretive signs. Many first time visitors to the Oxbow Area think they’re heading in the wrong direction since Dickerson Road passes aging warehouses, apartments and a large trailer park complex. But at the road’s end, is a parking lot that is the beginning of the nature area. In 1997, flooding along the Truckee River destroyed a network of wooden boardwalks that once lined the park’s shore. The elevated walkways offered excellent views of the river and surrounding marshes. The city of Reno is conducting a survey of the damage and hopes to have new boardwalks and elevated platforms in place by next summer. Additionally, the city has obtained funding to construct several new boardwalks, which will extend deeper into the park. Despite the damage, the area remains a wonderful nature refuge and a peaceful retreat from the hustle of everyday life. The path to the right of the parking area is a good place to begin a visit since it includes an elevated wooden platform that affords an overview of the entire park. Interpretive signage explains a variety of things, including, the Truckee River system, the river’s water flow, the purposes of a beaver lodge, the native flora and fauna and how the “riparian” habitat nurtures certain types of plants and animals. The main trail continues west through small groves of tall trees and grassy open areas that contain many of the elements that make the area’s environment so unique—such as sagebrush growing adjacent to thick cottonwoods. The path winds through the jungle-thick vegetation, which includes wormwood, horsetails, poison hemlock, stinging nettles, cattails, bulrush and wild rose. If you look closely, you can even find giant mushrooms growing at the base of some of the plants. Interpretive signs explaining such things as how cottonwoods can get sick (e.g. beavers can chew them up—which is why so many trees in the area have chickenwire around their base). A few wooden benches along the way provide places to relax, listen to the soothing sounds of the bubbling Truckee River and contemplate the beautiful surroundings. Tucked into the overgrowth are several marked marsh and pond areas, home to a variety of waterfowl. Cattails and grass indicate their locations. Guided nature walks of the area are conducted regularly with various area schools. The public is invited to join any of the school tours. For more information about scheduled tours contact the Reno Parks and Recreation Department, 775-334-3808. Despite her reputation as a fortune-teller known as the “Washoe Seeress” in the late 19th century, even Eilley Orrum Bowers could not have predicted her long-lasting notoriety. Bowers is perhaps best known today as one-half of the namesake couple who built Bowers Mansion in Washoe Valley—the big stone structure on the western side of the valley that you can see from U.S. 395. Eilley Bowers was born Allison Orrum in Scotland in 1826 (her nickname was Eilley). At the age of 15, she married a Mormon missionary and traveled to the United States. The couple first settled in Illinois, then moved to Salt Lake City. Following the Mormon custom of her day, her husband, Stephen Hunter, took several wives after they had settled in Utah. Eilley, however, did not enjoy the polygamous lifestyle and soon divorced Hunter. In 1853, she married Alexander Cowan. The two moved to the Carson Valley where they purchased 300 acres in Washoe Valley. In 1857, Cowan, who was also Mormon, returned to Salt Lake City during troubles between the church and the U.S. government. Eilley chose to divorce Cowan rather than return to Utah and moved to Johntown, a mining camp below Virginia City, where she opened a boardinghouse. During this time, she acquired a handful of mining claims from boarders unable to pay their debts and met a Comstock miner, Lemuel "Sandy" Bowers, who would become her third husband. The two combined their mining holdings and, as luck would have it, ended up owning one of the Comstock's earliest major silver strikes. Within a short time, the Bowers were among Nevada's first mining millionaires. 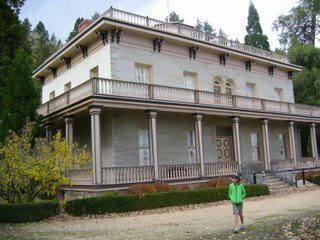 Deciding to spend their seemingly limitless wealth, in 1864, the Bowers' began building a huge stone mansion on Eilley's acreage in Washoe Valley. While the home was under construction, they traveled to Europe to purchase furnishings. When it was completed, the mansion was one of the most magnificent homes in the state and the Bowers were willing party hosts. During the next four years, they indulged themselves on the finest clothing, furniture, and collectibles. In 1868, however, Sandy Bowers suddenly died of silicosis at the age of 35. By then, the original mine had become tapped out and he had invested much of their money in unprofitable mining ventures. After the estate was finally settled, Eilley found herself penniless. Despite her best efforts to hold on to the magnificent mansion, she was unable to keep it. Her misfortune continued when, in 1874, her adopted daughter, Persia, died at the age of 12. Since her days in Salt Lake City, Eilley had been intrigued by the occult. Apparently during that time she acquired a crystal ball for fortune telling and had prognosticated for friends. In 1875, following her many financial and personal setbacks, Eilley set up shop in Virginia City as the "Washoe Seeress." Despite skeptics, she practiced her arcane arts for nearly a decade, until the decline of the Comstock. In the 1880s, she moved to San Francisco, where she worked in various jobs, including--as she had so many years before--operating a small boardinghouse. In 1898, she was placed in a rest home in Oakland, where she died in 1903 at the age of 77. The story of Bowers Mansion almost parallels Eilley's life. In the early 1870s, Eilley Bowers substantially renovated the mansion when she attempted to convert it into a resort and added a third story. Unable to pay the workmen, the floor was never properly finished. Additionally, the cupola and trademark balconies around the upper floor and the original roof were removed during Eilley's remodeling. In the 1960s, Washoe County voters approved a bond that financed restoration of the house to its original state. The result is a beautiful, 19th century residence that provides a glimpse into the lives of early Comstock millionaires. While tours of the mansion are only offered from Memorial Day to Labor Day and on weekends in April, May, September, and October, the site is worth a visit at any time of the year. During our recent visit, we wandered around the outside of the mansion, admiring the workmanship, and visited the former Bowers Root Cellar, now a visitors center that is open all year. Inside, it contains a number of historic exhibits about Washoe Valley and the Bowers. Additionally, we discovered a quarter-mile walk uphill from the mansion to the graves of Sandy, Eilley, and Persia Bowers. Perhaps because of all the sadness in their lives, it seemed somehow appropriate that the graves of all three have marvelous, sweeping views of the surrounding Washoe Valley. Adjacent to the mansion is some 40 acres of parkland that includes plenty of lawn, a geothermal-heated swimming pool, picnic tables, and volleyball courts. Bowers Mansion is located about eight miles north of Carson City via U.S. 395 and State Route 429 (the Washoe Valley frontage road). For more information about the mansion, call 775-849-0201. The earliest visitors to the Las Vegas Valley came because of the presence of water. In fact, the name, Las Vegas, is Spanish for “the meadows,” and reflects the fact that the area was home to natural springs and lush grassy fields. While the original springs that once bubbled to the surface were tamed long ago, the spot from which the valley’s water originated still exists. For years, the site been hidden behind walls and fences on land owned by the Las Vegas Valley Water District. But now it’s being transformed into a diverse biological refuge and museum complex that is dedicated to telling the region’s natural history. Known as the Las Vegas Springs Preserve, this 180-acre compound, scheduled to open in the spring of 2007, will include restored natural habitat and exhibition buildings. The site, known as the North Well Field or “Big Springs,” is located about three miles west of downtown Las Vegas. The project is a joint effort by the Las Vegas Valley Water District, the non-profit Las Vegas Springs Preserve Foundation and the Nevada State Museum. The latter will be relocating its Southern Nevada branch from Lorenzi Park to new quarters attached to the Preserve sometime in 2008. As for what’s underway, work has been completed on several of the structures that will serve as the Visitor Center and the Desert Living Center. When open, the former will have interactive exhibits that will interpret the role that the springs played in the development of Las Vegas. Additionally, it will house a high-definition IMAX-style theater and a photo gallery. Nearby is an open-air amphitheater, café and retail area. The exhibits will include a plate tectonic display that asks visitors to choose which plates move and the results of that movement, a night-goggle experiment to show how nocturnal creatures can see, and a large re-creation of a desert flash flood, which will immerse visitors into the center of a realistic flood that will include more than 5,000 gallons of water racing toward them. The Desert Living Center is being designed to showcase urban sustainability in the West. It will house agencies that promote homeowners, businesses and educators to embrace good environmental practices. In keeping with the environmental sustainability nature of the preserve, all structures incorporate eco-friendly materials and designs. Building beams are made of recompressed, recycled wood, rafters are recycled railroad ties and commercial grade straw bales are used in walls for insulation. Building that resemble rock are actually rammed earth and solar panels will generate heat and power. Workers have also been planting an 8-acre Botanical Gardens to showcase native, drought-tolerant species of plants that can be used in landscaping and promote responsible water use in the dry Southern Nevada climate. A large part of the preserve will be left mostly undeveloped but with some 6,500 linear feet of walking trails and 14 interpretive displays that will describe the early settlement and development of Las Vegas. The trails will wind around a handful of historic structures and archaeological sites that remain on the site. Chief among these historic reminders of the area’s earlier uses are several wooden pumping stations that resemble head frames found in old mining towns, an old springhouse built over a spring, ranch house foundations and archaeological digs. Alongside the trail walk is a Cienega or desert wetland, which will be home to hundreds of native plants and animals. The site will include a reconstructed cauldron pool that will duplicate the natural springs that once gurgled from beneath the surface. 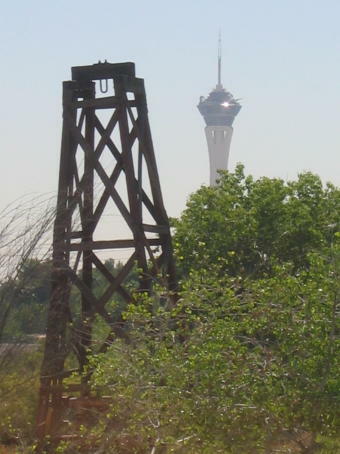 Development in Las Vegas during the past century has lowered the original water table so much so that the springs no longer bubble from the ground. However, at one time the flow from the springs was quite remarkable. About a year or two after the facility opens, the Nevada State Museum and Historical Society hopes to complete its new building, which will house its collection of historic artifacts and exhibitions describing Southern Nevada history. For more information about the new Las Vegas Springs Preserve, go to www.springspreserve.org. Much of the credit for UNR’s classic college environment goes to the heirs of Comstock silver baron John Mackay. In the early part of the 20th century, the Mackay family donated more than $1.5 million to establish the Mackay School of Mining as well as to develop the Quad, a science hall, and other campus buildings. Noted 19th century New York architect Stanford White’s firm designed both the Quad (short for quadrangle, which is the large rectangular open area in the center of the campus) and the mining school. White was also responsible for the design of the original Madison Square Garden in New York. The firm based the plan for the elm-lined Quad on Thomas Jefferson’s design of the University of Virginia Lawn, which is also an open expanse of grass lined with trees that serves as the heart of that university. Most of UNR’s most historic and picturesque buildings surround the Quad. In fact, that part of the campus has been designated as a National Historic District. At the north end of the Quad is the Mackay School of Mines Building, erected in 1908, and commissioned by Clarence Mackay, John’s son. The mining school is a picturesque two-story, brick and stone structure with Georgian details that boasts four 28-foot Tuscan-style columns of Indiana limestone. The building houses the DeLaMare Library, one of the world’s largest collections of mining books as well as the W.M. Keck Museum, which has more than 6,000 mineral samples and fossils along with historic mining tools and equipment. Additionally, it is also the home of the Mary B. Ansari Map Library, which contains some 136,000 maps, and a pair of public exhibition rooms displaying an old-time mining engineer’s office and pieces from the fabulous Mackay Silver Collection. The latter was designed in 1876 by the famed Tiffany’s jewelers of New York. The full collection includes 1,350 pieces crafted by 200 silversmiths over a two-year period, using 14,718 ounces of Comstock silver. 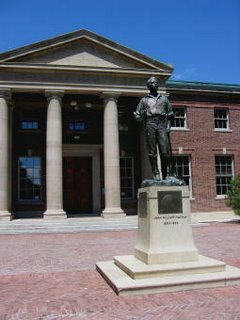 In front of the school is a bronze statue of John Mackay that is noteworthy because it was created by sculptor Gutzon Borglum, who later carved the presidential faces into Mount Rushmore (from 1927 to 1941). At the other end of the Quad is Morrill Hall, the first building erected on the Reno campus after the state relocated the university to Reno from Elko. Constructed in 1885, the structure is named for U.S. Senator Justin S. Morrill of Vermont, who authored the 1862 Land-Grant College Act, which led to the development of the University of Nevada and other colleges throughout the country. Morrill Hall is a four-story brick building in the Second Empire architectural style. It originally housed the entire university offices and classrooms. The structure is listed on the National Register of Historic Places. •Lincoln Hall and Manzanita Hall (both built in 1896), which have served as student dormitories for more than a century. Lincoln Hall was constructed in a late 19th century architectural style known as Eclectic, which incorporated several popular styles of the time including Flemish gables, a Colonial Revival cupola, and Neo-Romanesque arches. •Jones Visitors Center (1914), which was the university’s first library. 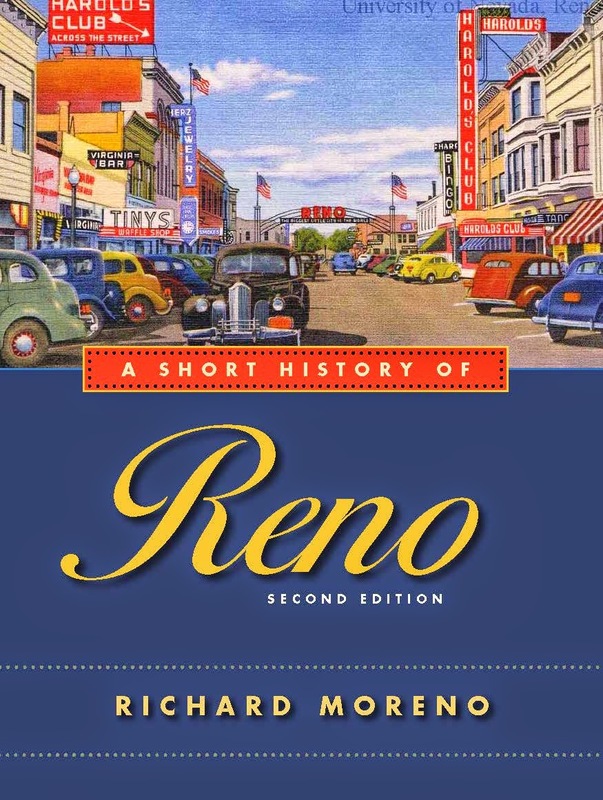 It was designed by renowned Reno architect Frederick DeLongchamps, who was also responsible for the downtown Reno post office and the Washoe County Courthouse. •Clark Administration Building (1927), which served as the university’s library from 1927 to 1962. The building is named after Alice McManus Clark, wife of William A. Clark, Jr., whose father was a U.S. Senator from Montana and namesake for Clark County, Nevada. Senator Clark was a wealthy 19th century mining and railroad magnate, who established the city of Las Vegas in 1905. •Mackay Science Hall (1930), a Georgian-style building that was also designed by DeLongchamps. The brick and stone-pillared structure represented the final gift to the university from Clarence Mackay. For a guided walking tour of the campus, contact UNR at 775-784-4700.